It’s moving day, you have a large couch and instead of disassembling it, you think it’s easier to maneuver it through the door. You think you have the perfect angle, so you push the giant cushiony apparatus to the other side. Things get a bit rocky, but you manage to successfully get it into your living room and set the couch down. In a moment of pure euphoria, you throw your hands up, only to have them clutch the top of your skull once you turn around and see the damage you’ve caused to your walls and door frames. Although it might be a pain, disassembling your furniture is essential for avoiding situations like this. Many modern couches, chairs and tables are too big to comfortably fit through average-sized door frames and hallways. Carrying them in one piece significantly increases the chances of putting a hole in a wall or cracking a piece of your door frame, which can add up to be an expensive list of repairs. So make your life easier by taking them apart and moving them piece by piece. Not only will this reduce the chances of high repair costs, it will also save you a trip to the hospital. The last thing you want to do is throw out your back because you were too stubborn to take apart a large piece of furniture, so break it down into pieces and rebuild it once you get it inside. Your body will love you for not causing it pain and your bank account won’t suffer a hit from an expensive hospital bill. Of course, if you need help with the assembly or disassembly of furniture, the San Clemente movers at Coast Valley Moving would be more than willing to help. With their extensive training and wealth of experience, they can break your furniture down, move it in and rebuild it in no time. 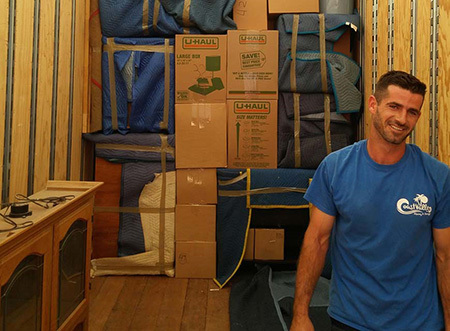 Out of all residential moving companies in San Clemente and Newport Beach, we can do this in the most efficient manner, causing no damage to your items or household. Call Coast Valley Moving or fill out our quick online quote form to get your free estimate today!